The price of petrol will go up! "The new price of premium leaded petrol (ULG 97) is RM2.70 per litre beginning midnight tonight, it was announced a moment ago. 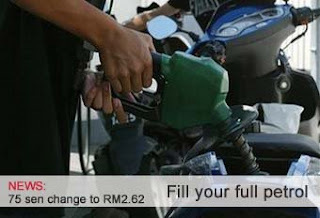 The price for ULG 92 petrol per litre went up by 74 sen to RM2.62. Diesel will go up by RM1 per litre to RM2.58. The 78 sen hike or 40 per cent increase for the ULG 97 petrol is still below the antiticpated RM4 per litre price projected earlier and among the cheapest in Asia"
After working hour, I was surprised when I saw a lot of cars lining up towards the petrol stations everywhere! There was a heavy traffic jam at the LDP highway and near tol sunway - puchong. It was really crazy! 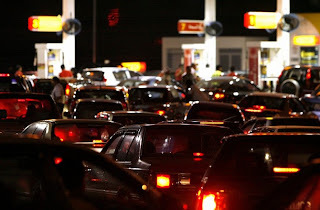 @_@ Many cars had to line up to buy petrol before the price increase at midnight.. So, my family and I make out with our super dinner in Sunway Pyramid as we have planned on yestarday..:( We late to reach sunway.. Neverind, we were lucky that the tickets movie was ready.. After watching movie 'The Chronicles of Narnia', we went back to home..but, still got lot of cars there @_@ My mum suggested that we went to the Caltex petrol station near tol puchong-sunway for filling petrol up to FULL into my car Haha.. we hoever didn't have to wait too long because it was near 12 midnight, so its number of car got lesser.. It was easy like a piece of cake. You all sure get sms, email or online news about the petrol news, rite? That is why the people have to rush..rush..hehe. My eldest sis have to pay RM 100 if petrol has already raised.. For me, I might pay RM 40 or 50 for my car VIVA..I think so..
my mother said she have to pay RM70 of RM50 for her car from onwards instead ! !